CarGurus has 7,357 nationwide Sonic listings starting at $999. Chevrolet may be tipping its emphasis toward trucks and giant SUVs heading into 2016, but at the small end of its product line, the subcompact Sonic is flourishing. Sales are robust, and the Sonic has done much better than anyone expected. Early rumors had the Sonic expanding to include an electric-vehicle drivetrain capable of up to 200 miles of range on a charge. However, those reports have now been clarified as being about the standalone Chevy Bolt, which will be marketed separately from the Sonic. The 2016 Chevy Sonic will likely use the same engines as the 2015. This means that the cars will come with either a 1.8-liter 4-cylinder or 1.4-liter turbocharged 4-cylinder engine. Both make about 140 hp. It would not be a big surprise if Chevy dropped the 1.8, as the 1.4-liter engine gets better fuel economy. Both manual and automatic 6-speed transmissions are available with either engine. 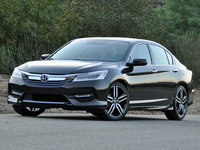 The 1.4-liter turbo and 6-speed manual can get 40 mpg highway, but fuel economy is only average for the class. All models take regular fuel. The hatchback is the looker of the two body styles offered. The 5-door hatch has style elements popular on other vehicles. For example, the rear looks like a Kia Soul, and the front reminds many of a Golf GTI. The rear doors are opened with high-mounted handles inset into the upper window frame, a styling cue recently adopted by the new Honda HR-V. Blacked-out wheels and other options make the Sonic easy to customize. Much of the new Chevy Bolt’s style is copied from the existing Sonic. Chevy markets the Sonic as “motorcycle inspired.” The idea is that the Sonic is a sort of four-wheeled city bike. Everything from the instrument cluster to the rear tail lamps to the optional Borla exhaust reinforces that theme. Capable of zipping from 0 to 60 mph in about 8 seconds, reviewers consider the Sonic a fun car to toss around. The 2016 Chevy Sonic returns with mainly cosmetic changes. Chevy has released images showing both the sedan and hatchback in an announcement, so we are confident both body styles will continue for 2016. Color changes include the deletion of Ashen Gray Metallic and Black Granite Metallic. In place of these, Nightfall Gray Metallic, Mosaic, Black Metallic, and Kinetic Blue Metallic are added. Infotainment offerings were updated in 2015 for the Sonic line. 4G LTE Wi-Fi is available. Navigation is not, but the Sonic will include a complimentary 6-month OnStar subscription that offers audible turn-by-turn directions. Or a Sonic owner can connect the BringGo app from his or her phone to the optional Chevrolet MyLink 7-inch touchscreen display. This option also allows for a Bluetooth connection with one’s phone to stream music from iTunes or Pandora and similar apps. A Kicker amp/subwoofer is available as an option. Sirius XM is also part of the MyLink options package. Safety offerings for the 2016 Chevy Sonic are impressive for a vehicle in this price and size segment. The Sonic has earned 5-star crash ratings from NHTSA and also aced every crash test done by the IIHS. That includes the tricky new small frontal overlap test. Sonic thus is a Top Safety Pick from IIHS. Basic forward-collision alert is available, as is lane-departure warning. A rear-vision camera is also available on some trims. In the event of an accident, the Sonic has 10 airbags to protect occupants, including driver and passenger knee airbags. The OnStar Directions and Connections plan, which is complimentary for 6 months and available by subscription after that, can even call for help in a crash and provide first responders with your location and predicted status. In a car this small, every safety advantage is welcome. We expect Chevy will offer the Sonic sedan and hatch in four trim levels. Base LS trims will cost about $15K, with automatic transmissions adding about $1,200. LT and LTZ trims add more options as standard equipment, and the RS is the sporty trim. A fully loaded RS automatic hatchback will likely top $22,000. That moves the Sonic into some pretty tough competitive company, including the new Honda HR-V and Mazda CX-3, though those would be less well equipped models at that price point. 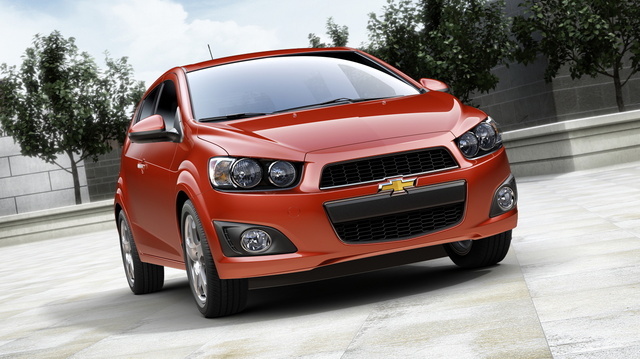 The 2016 Chevy Sonic will enter the market a proven sales winner in a very challenging segment. In either stripped-down basic city-car form or fully outfitted with options, the Sonic has a lot of appeal to those who want a subcompact car with a strong personality. What's your take on the 2016 Chevrolet Sonic? Have you driven a 2016 Chevrolet Sonic? Can I get a baby in and out of its carseat easily?